Last week, we headed in to Old Fort to vote in our first North Carolina elections and also to stop by The Appalachian Artisan Society (TAAS) gallery. The gallery, which features all kinds of artwork from over 60 local artisans and handcrafters, is a beautiful place. 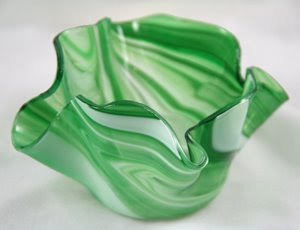 We were especially inspired by the glass and the woodworking items, and came away with a stunning green fused glass sculpture (pictured above) by Carol Sheppard of Southern Orchid Glass and Jewelry Designs and a wood bin constructed by Bob Conard of Candler, North Carolina. Another feature of the gallery is the new Catawba Vale Coffee Cafe. The menu has several sandwiches and quesadillas named after local names and places, such as the Upper Falls (tuna salad) and the Mill Creek Quesadilla. You can also find a variety of salads on the menu. And their frozen fruit smoothies are great, especially now that warmer weather is the norm. Of course, being a cafe, they serve several coffee drinks as well. If you’re in the area and like local, handcrafted art, stop in to The Appalachian Artisan Society Gallery, which is open Tuesday-Friday (10am-5pm) and Saturday (10am-6pm).